For other places with the same name, see Svetlogorsk. Svetlogorsk (Russian: Светлого́рск​ (help·info)), prior to 1947 known by its German name Rauschen (Polish: Ruszowice; Lithuanian: Raušiai)), is a coastal resort town and the administrative center of Svetlogorsky District of Kaliningrad Oblast, Russia, located on the coast of the Baltic Sea on the Sambia Peninsula, 39 kilometers (24 mi) northwest of Kaliningrad, the administrative center of the oblast. Population: 10,772 (2010 Census); 10,950 (2002 Census); 11,881 (1989 Census). Svetlogorsk is situated in the historical region of Sambia of East Prussia. It was established in 1258 as a Sambian fishermen settlement named Ruse-moter (lit. region of cellars). The Teutonic Order that conquered the land gradually corrupted the name into Rause-moter, Raushe-moter, and finally Rauschen. In the early 19th century, the place became fashionable among German vacationers. On June 24, 1820, it was officially recognized as a spa town. During his visit to Rauschen in 1840, King Frederick William IV of Prussia ordered the sea embankment to be beautified. The arrival of the Königsberg railway in 1900 boosted the resort's popularity. A cable railway and a racecourse were constructed in Rauschen before World War I. Otto Nicolai and Thomas Mann were among the celebrities who stayed there. In 14 April 1945, Rauschen was conquered by the Soviet Union in the course of World War II. It became a part of Kaliningrad Oblast and in 17 June 1947 was given its present name. Today, it is a moderately popular summer resort town thanks to its beachfront and many spas, clubs, and attractions. It has arguably the best preserved Prussian heritage and architecture amongst former Soviet towns that were once Prussian and survived the destruction of Konigsberg and other settlements from WWII. Within the framework of administrative divisions, Svetlogorsk serves as the administrative center of Svetlogorsky District. 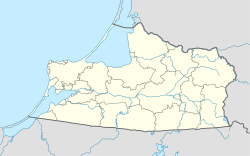 As an administrative division, it is incorporated within Svetlogorsky District as the town of district significance of Svetlogorsk. As a municipal division, the town of district significance of Svetlogorsk is incorporated within Svetlogorsky Municipal District as Svetlogorskoye Urban Settlement. Svetlogorsk is connected with Kaliningrad, Zelenogradsk, and Pionersky by electrified railway (3000 V DC). Svetlogorsk has two railway stations: Svetlogorsk-1 and Svetlogorsk-2 (terminus). There are many private companies that operate buses between Svetlogorsk and Kaliningrad. ^ a b c Энциклопедия Города России. Moscow: Большая Российская Энциклопедия. 2003. p. 413. ISBN 5-7107-7399-9. Калининградская областная Дума. Закон №182 от 2 ноября 2007 г. «Об организации местного самоуправления на территории Светлогорского городского округа», в ред. Закона №343 от 6 октября 2014 г. «О внесении изменений в отдельные законодательные акты Калининградской области». Вступил в силу со дня официального опубликования. Опубликован: "Калининградская правда", №209, 7 ноября 2007 г. (Kaliningrad Oblast Duma. Law #182 of November 2, 2007 On the Organization of the Local Self-Government on the Territory of Svetlogorsky Urban Okrug, as amended by the Law #343 of October 6, 2014 On Amending Various Legislative Acts of Kaliningrad Oblast. Effective as of the day of the official publication.). This page was last edited on 9 December 2018, at 09:22 (UTC).